Between the typhoons, the tarantulas, the Dengue scares and the rough rides on propeller planes low over the South China sea, it was, for me, an average Christmas break. But it was a break of a week that stretched into two, then three, and maybe because they had arrived exactly halfway through my trip around the world I clung onto the friends that had come to visit me in South East Asia like a drowning woman. While we waited out a rainstorm by watching Blade Runner in a bungalow, I stretched out lazily and asked James, my housemate of almost ten years, to nudge another beer in my direction and my housemate Olly said well if James was up could he grab him one too. I was hit with a cold fear and thought: do I actually want to keep cycling, or do I want this back more? My time off the bike had not been without incident. 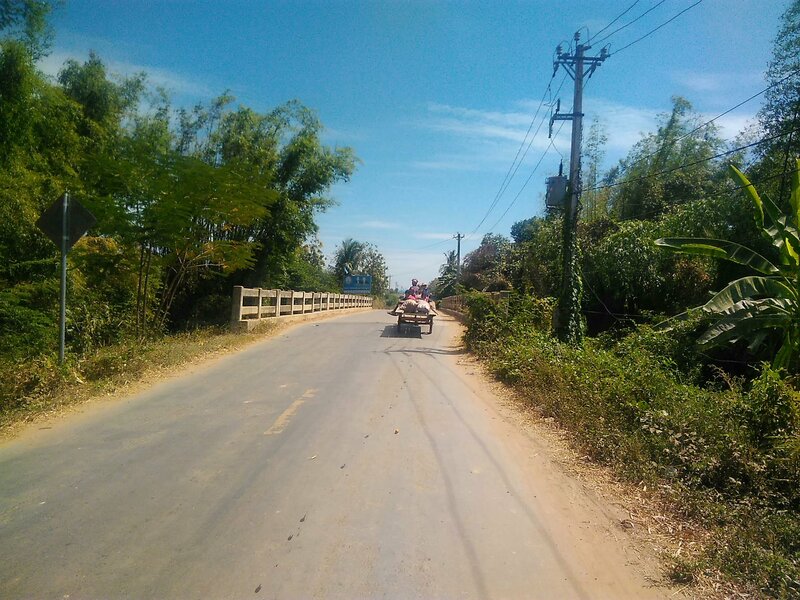 The typhoon that threatened to decimate our paradise island off the southern coast of Vietnam at Christmas tore up the dirt road to the ferry port. So on Boxing Day I swam through knee-deep mud to reach the jetty as the only boat of the day prepared to leave – only to realise I’d left my passport in the bungalow on the other side of the swamp. 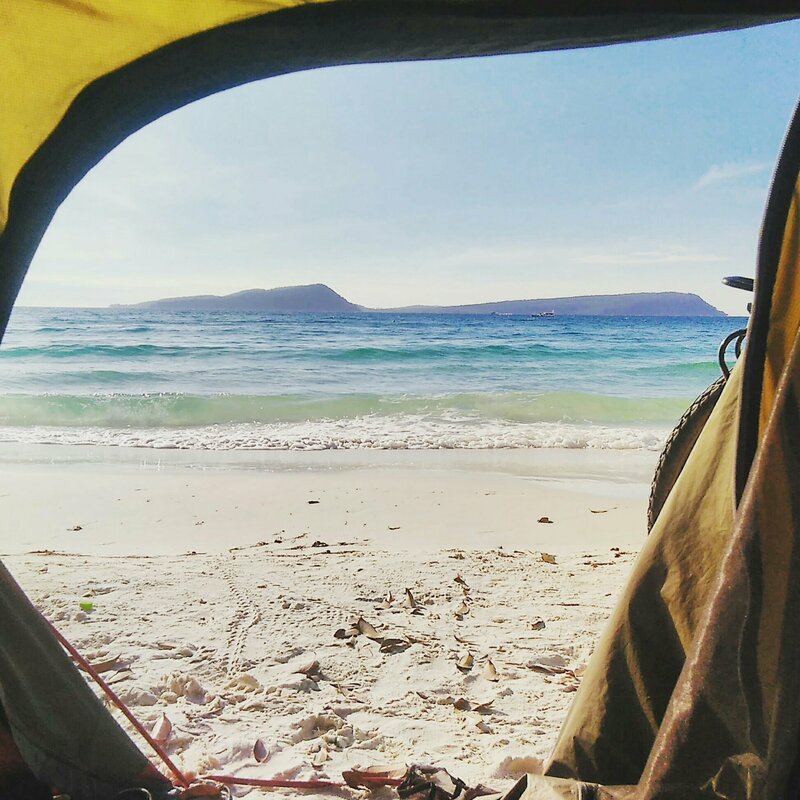 I crossed the border and rode fast through southern Cambodia to meet up with my friends again on Koh Rong island for the New Year, where monkeys came down from the jungle at night to squabble outside my tent. I enjoyed a short but enthusiastic bout of food poisoning that culminated with me flinging myself out of my tent in the middle of the night to chunder spectacularly in the direction of a spider the size of a dinner plate. 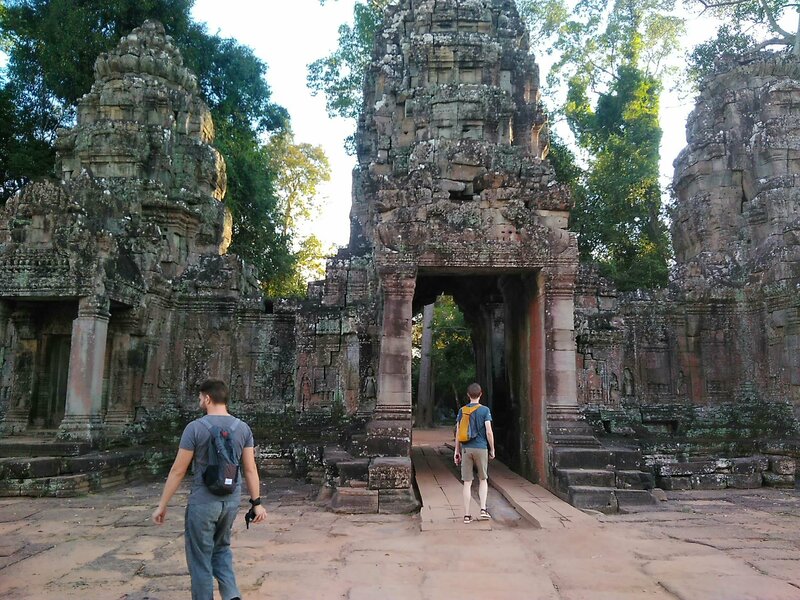 In-between there were Pina Coladas; nights spent drifting off on white sand listening to the waves break next to my bicycle; a trip out to Siem Riep to clamber over the ruins of the temples at Angkor. Slowly, though, my friends left to go back to their own lives and travels, like lights going out, and I found myself alone in the Cambodian capital of Phnom Penh wondering what I was supposed to do next. Friends were dotted across Asia like checkpoints: instead of being alone I could join Anastasia in Laos, or James and Emma on scooters in south Vietnam, or Ross and Alessia in north Vietnam, or Joey in Cambodia. I had the perfect excuse – a meaty article commission that needed plenty of research – to trade my wheels for a life on the long-distance minibuses that link up stops on the banana pancake trail. But as I studied the map over a bowl of Cambodian noodle soup, I realised that buses didn’t connect up the places that I wanted to visit. No bus would risk the dirt track that ran through the jungle alongside the Mekong, or join up the spider-eating capitals of Cambodia with the remote hilltop village wats; or divert off east onto Lao’s Bolavan Plateau, its waterfalls and gravel paths and coffee plantations; and still drop me off in Vietnam with enough time to meander slowly up the coast and meet my sister and her boyfriend in Hanoi. 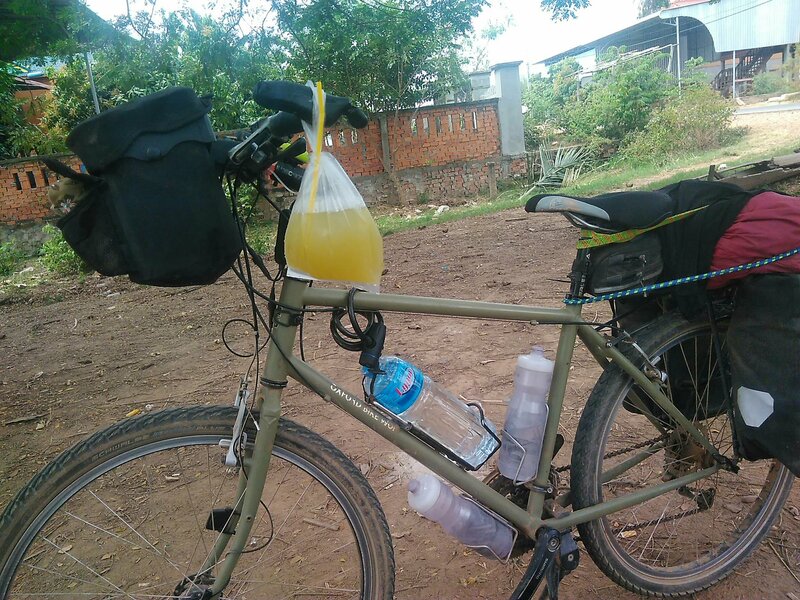 The only way was by bicycle, and the only route was due north, so one hot morning, for the first time in a long time, I loaded my bags onto my bike, readjusted Ewan McGregor’s sunbleached face in my handlebar bag and took to the highway that ran out of Phnom Penh. 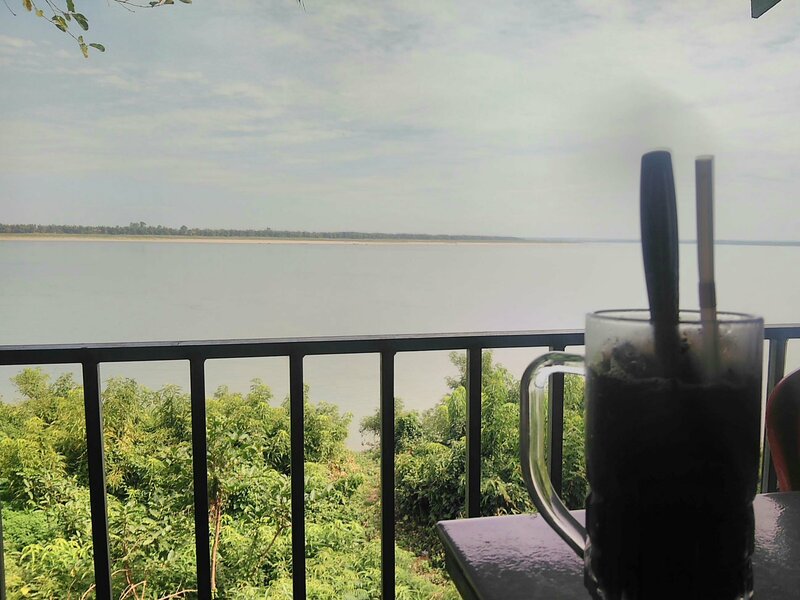 I slept above a karaoke bar in Roka Kaong Pi that night – this is surprisingly hard to avoid on the Cambodian stretch of the Mekong and the best advice I can give you is to give wide berth to anything marked KTV – and fell asleep pondering my next decision. Well, you can’t keep a good Pamir Highway-conquering, rough-road loving cyclist down. So the next morning I drank an iced coffee then turned right towards the river, dodging stalls selling cooked crickets along an asphalt road that eventually disappeared altogether, and as it turned to dust the first of the helloes shrieked at me by children who came running to the roadside catapulted my mind back to Tajikistan. I bumped along a dirt track through dense-packed jungle, and I could hear voices and occasionally music, discordant gamelan drifting through the trees. I called up my map app only to see what every navigationally-challenged cyclist secretly dreads: my blue location dot was adrift on a sea of beige. Maps.Me said that I wasn’t even on a road, and I was inclined to agree. 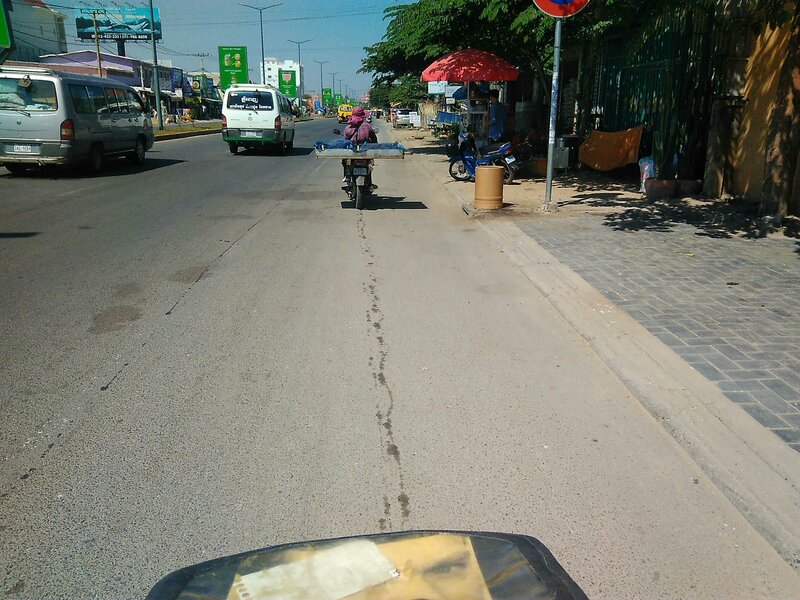 Eventually an old man on a scooter led me back to the main track, and I soon cranked to a halt outside a small house serving lunch, leaving small deposits of red sand in my wake. An elderly woman – “Mama” – took me by the hand and led me around the corner to a bucket shower while her daughter cooked me noodles, and as I ate them in the shade Mama came back with a mobile phone and her English-speaking daughter explained that her mum wanted to give me a box of bananas and some cold water for the journey. Mama’s only word in English was sorry, and my only word in Khmer was thank you, so while she apologised and wrapped her hand around mine I thanked her and adored Cambodia. “Sister, do you want to sleep?” Her daughter wondered, offering me a hammock. 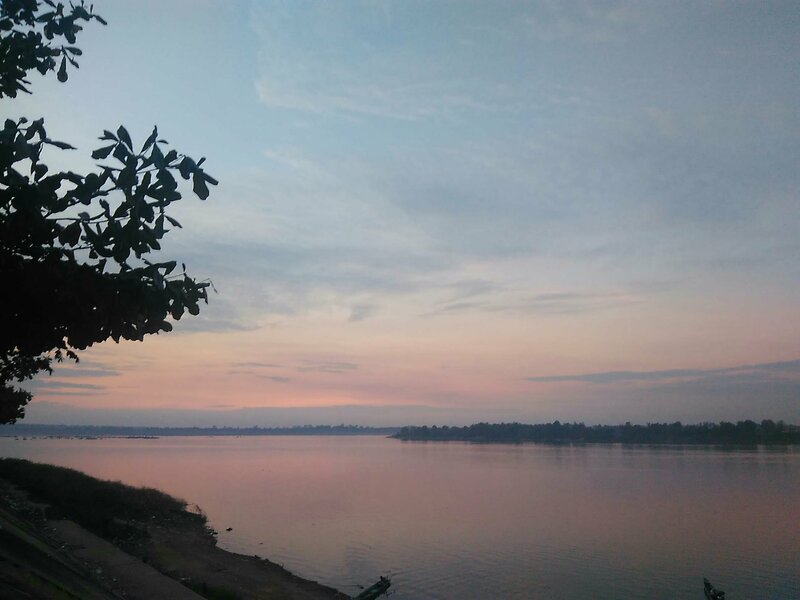 But the kindness and the warmth of Cambodians and their noodles had reinvigorated me, and as I re-took the road the palm forests cleared and the Mekong – vast, smooth, still in the heat haze – was beside me. I settled into life on the river and, at the same time, I settled back into life on the bicycle. 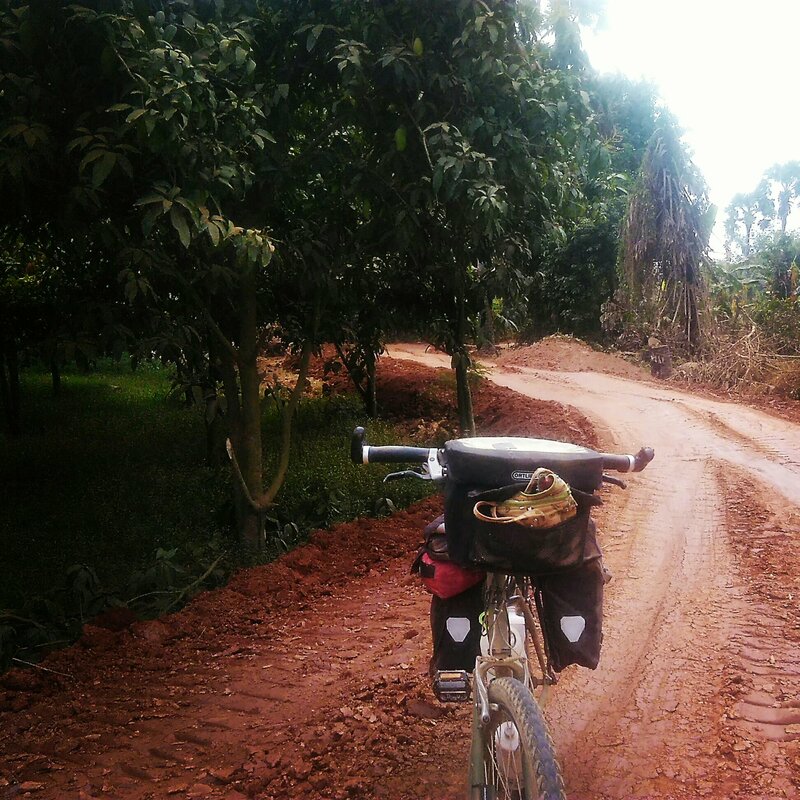 The rhythm of cycling in South East Asia is entirely different to anywhere else I have cycled so far. Instead of lugging a week’s worth of bread and Nutella around with you, breakfast and lunch are eaten hot from stalls at the side of the road. Instead of rolling out of my sleeping bag first thing in the morning to light my stove and boil water, I drank iced coffee at plastic tables sat on tiny plastic chairs. In some ways it was difficult, being deprived of this small area of control in a life where you have almost no control over anything. Some days it went entirely wrong: the battered bananas I thought I’d bought turned out to be fried meat cutlets; the chilli-salt mix I’d picked up was replete with tiny shrimp. Then one day on a particularly remote stretch I stopped my bike beside an uninhabited road stall in the shade of a banana palm and the plastic bags I’d accumulated over the past hour – one full of sugar cane juice, one full of genuine battered bananas and a baguette stuffed with pickled vegetables – swung from my handlebars and I thought, I’m getting the hang of this. In Stung Treng I had dinner and traded stories with Ian and Kirsty, a couple from Yorkshire who were at the start of their world tour, and the following day I followed in their wake along the bumpy road towards Laos. It was a long, hot stretch to my next stop at the 4,000 islands, but I was racing the expiration date of my Cambodian visa. It was the first time on this tour that I’d pushed the limit of a visa so hard. And what a 30 days it had been: among them were the days I’d spent with my best friends scrambling over the ruins of ancient temples; the days I woke up in $5, windowless guesthouse rooms and realised that the dawn would never come and stared into the darkness and thought, I don’t want to do this anymore. There were the days I rebuilt my confidence on rough roads and disrupted entire school days by bawling HELLO through the open windows of sweltering classrooms; the day I sat with Ian and Kirsty by the Mekong and over beers told the story of how I got to Cambodia from London and remembered the Rhine and the Danube and why I set out in the first place. 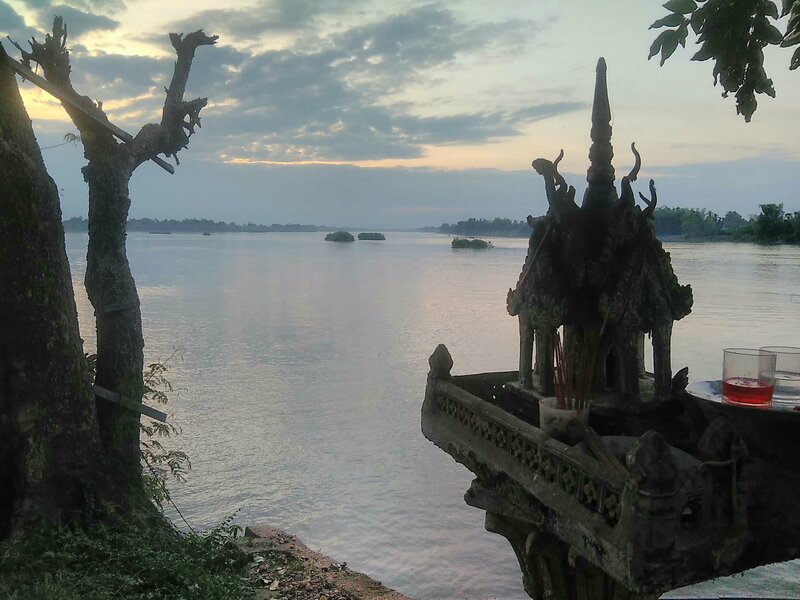 I lumbered into Laos with one snapped spoke dangling from my rear wheel and took a boat across the Mekong to the hippy hangout on Don Det. A staging point on my journey, I’d not really thought how long I wanted to stay. 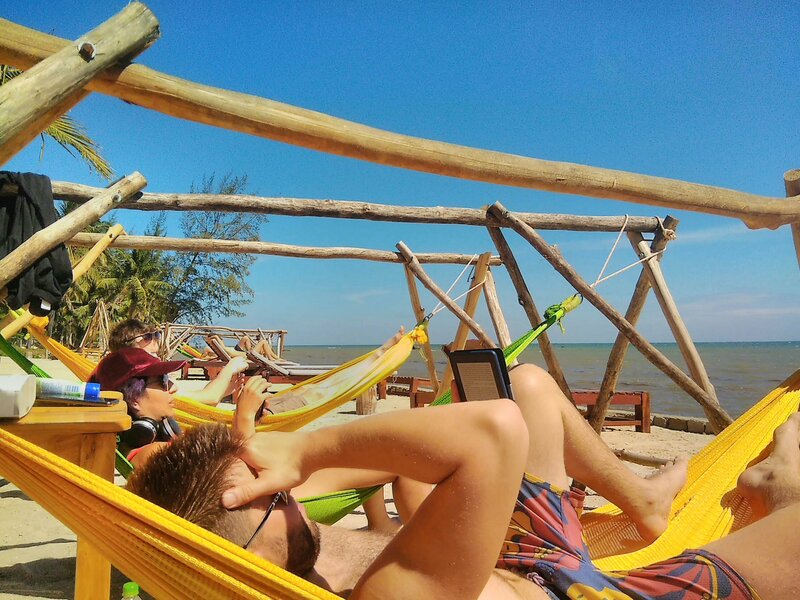 On my bleakest days I’d thought maybe I’d never leave: that I’d probably wrap myself in the backpacking culture and see out the time before I was due to get to Hanoi in a riverside hammock reading Stephen King novels. But, for the first time in a long time, I had a long day under my belt. My bike was covered in dirt and limping and I had to find a town with a bicycle shop. Ahead of me were the hills of southern Laos, the Bolavan Plateau and the Ho Chi Minh trail; and I realised that the lure of the road, with all its highs and its hardships was finally, and once again, enough, and not even the lure of a riverside hammock could stop me. Encouragement to continue is not enough.. keep going whenever you feel inspired. Your account of your journey is beautiful. Hi Liz really enjoying your blog very inspiring. Round the world cycle is definitely on the agenda for me. I was wondering what you do about bike security are you carrying a lock and what do you do at night if there is nothing to lock the bike to? Looking forward to your next update! Hi Peter! Excellent news! So I carried a really heavy d-lock all the way to SE Asia and used it – maybe twice in 10 months? Both times outside busy supermarkets in Europe. Since I’ve been in SE Asia I’ve only carried a super cheap cable lock I bought here for maybe $2 and I use it if I’m going to be out of eyeline of the bike for more than 10 mins or so. Honestly I think both are probably unnecessary: a heavily loaded bike is quite offputting for a casual thief I think, and if you load stuff (like tent and sleeping bag) on top of the rear bags it’s hard to get into them as well. Nights are more difficult. I have the MSR Tour tent, which has enough room in the porch for your bike to fit inside! So I never had to lock it. Friends I cycled with who didn’t have that room often locked the wheel to the frame and then put half the bike inside the tent so if anyone moved it they’d (hopefully) wake up. When I stay in guesthouses or hotels they usually offer to bring it inside at night, and I usually double check they have. So long story short – unfortunately you probably do need a lock and a cable, but they don’t need to be £££££ ones. If you have the budget, go for one of the tiny kryptonite d locks and a cable. It’s not so much the weight of the lock that’s a pain, it’s the space they take up – on a touring bike all the places you usually mount a lock to the frame are taken up with bottle cages so you have to stuff it in a pannier somehow. Oh I should also say – if you get insurance for your trip, it will most likely specify that you have to lock your bike up whenever you leave it/at night etc. Not locking it might void your insurance, so that’s something to bear in mind!